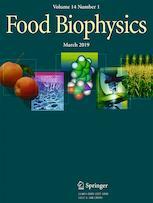 Food Biophysics publishes research on physical and chemical studies of food structure, properties, and functions and their relationship to the molecular structure and properties of food materials. Biophysical studies of food involve research at the intersection of food chemistry, biology, and engineering. The topics of research include the structure of food molecules, biopolymers, and food materials on the molecular, microscopic, and mesoscopic scales; the molecular basis of structure generation and maintenance in specific foods or food processing operations; mechanisms of antimicrobial action; structure/function relationships in food biopolymers; novel techniques in food biophysics, including spectroscopic, thermal and rheological studies; glass transitions in biomaterials and their influence on chemical reaction rate, microbial growth, or sensory properties; and molecular mechanisms of taste and smell.